2019 Annual Gulf Coast Summer Fest Jazz Edition will take place overlooking beautiful Pensacola Bay. It's more than just a concert, it’s an experience on the water! Tickets are go on sale March 1, 2019 at Pensacola Bay Center. 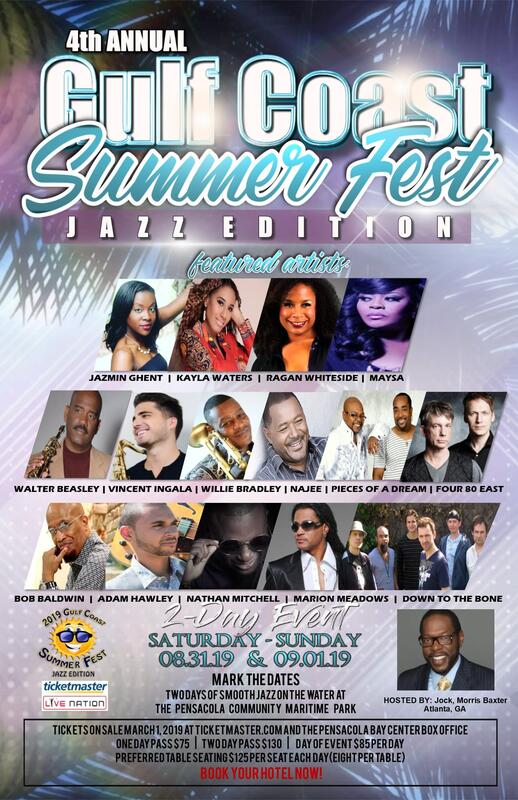 Line-up includes: JAZMIN GHENT; KAYLA WATERS; RAGAN WHITESIDE; MAYSA; WALTER BEASLEY; VINCENT INGALA; WILLIE BRADLEY; NAJEE; PIECES OF A DREAM; FOUR 80 EAST; BOB BALDWIN; ADAM HAWLEY; NATHAN MITCHELL; MARION MEADOWS; DOWN TO THE BONE.